I know it has been a long time since I have wrote one of these. Despite my hope this section of my blog has not been a top priority in the past few months but it doesn’t mean that I have stopped with the little one. I am trying to make an advent promise to myself to start again writing about this as often as possible so please bear with me. Acting out the story with the wooden nativity. I started by reading her the children’s Bible version of the story and she was hooked by the angel. 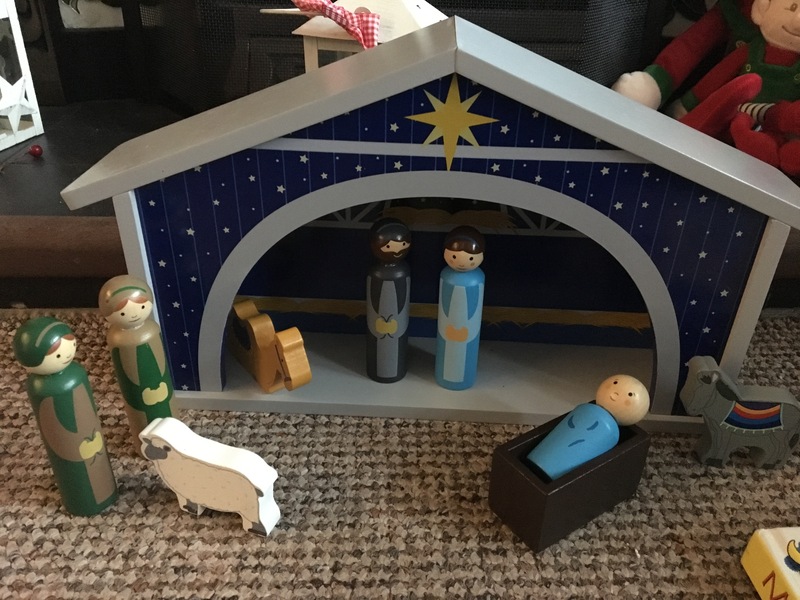 This year we managed to get a wooden nativity from Aldi, which I think is beautiful so I then brought this out to play. After allowing her to explore for a bit, I asked if she wanted to act the story out. So we used the pieces and the story in the Bible to slowly draw it all together. I’m not going to lie and say it was pretty. We often lost concentration, but I have to say my favourite part was listening to Little Donkey as she ran round pretending she too was on a long journey with her little wooden donkey. We had to wrap Jesus up so he didn’t get cold.